The picture only gives an idea of what you will knit but (hopefully ;-)) don't spoil the surprise. 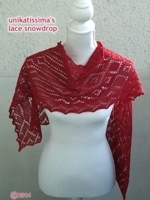 a lengthening pattern to adapt the length of your shawl in two places to your liking. has to be inserted on both sides of the center pattern. got a shawl (or tablerunner ;-)) of about 22 x 128 cm. 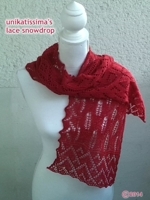 I knitted the respective daily pattern parts in about 25 min. 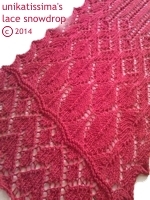 got a shawl of about 28 x 140 cm. And please be patient because there are times when I can come here only once a day to answer questions. measured length of blocked knitting from row 1 to 120 ca. 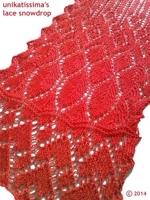 desired length of shawl ca. 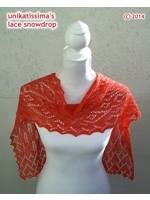 estimated length of shawl without inserts ca. estimated total length on both sides of the center pattern ca. I love it because it is so very pretty ! The pattern is beautifull and your instructions are very complete. Thank you for that. 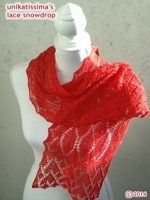 One suggestion: my scarf is curling at the sides, its a one ply yarn. 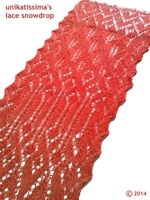 Next time I would knit 4 garter stitches at the beginning and end of each needle. thank you for your compliment and for your suggestion, that is very kind.